Though not really space rock in the typical, grandiose sense, Tungsten 74 certainly exploit some of the "classical" conventions of the genre (heavy, driving guitars and far out electronics, for instance). But there's a lot more going on here than just the interstellar drive and whoosh of guitars and synthesizers. In fact, a whole range of influences can be cited to mark out the sonic territory of Aleatory Element: Captain Beefheart weirdness, early 70s krautrock experimentation ala Neu and Faust, the NYC guitar terrorism of Glen Branca, 60s psychedelia. The overall impression is a harder-edged, perhaps punky Pink Floyd. Imagine, for instance, the Floyd spacecraft driven by the guitar of Thurston Moore and you've got a pretty good idea of the niche Tungsten 74 fills. The instrumentation on Aleatory Element is as varied as the music itself: in addition to the traditional setup (guitar, bass, drums, keys), banjo, theremin, accordion, recorder, and tribal percussion are employed on many of the songs, though no specific credits are given. The heavier songs (particularly "Trojan Carjacker" and "We Didn't Know It Was a Mutiny Until It Failed") are glorious anthems in the psychedelic freak out style of Ash Ra Tempel and Amon Duul II, while the acoustic pieces ("N.G." and "Bass Solo") offer an alarming contrast to the group's Faustian experiments with noise, tapes, samples, and twelve-tone improvisation ("Tradin' Paint," "Live at the Greenhouse"). 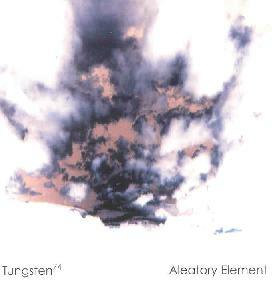 Aleatory Element will definitely appeal to those looking for aural adventurism, and the fact that every single piece on both these CDs was improvised over a one week period of intense recording suggests the group's solid commitment in striving to "challenge conventional notions of `the song' by deriving themes from improvisations, rather than improvising on a theme." Aleatory Element is distributed by Technical Echo Records. You can visit their web site at: http://www.technicalecho.com. Contact via snail mail c/o Technical Echo Records; 172 Fifth Ave #51; Brooklyn, NY 11217.